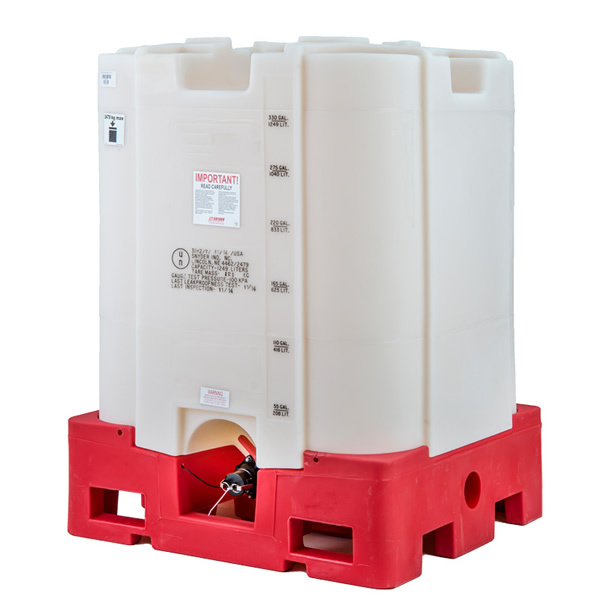 The industry’s best selling, all poly, IBCs provide an unparalleled value in long-term reusable IBCs for both hazardous and non-hazardous commodity liquids. Square Stackable’s rotationally molded, all poly design eliminates the corrosion and maintenance problems associated with poly-composite IBCs. A choice of pallets and sturdy bottom drain valve construction reduce the expensive maintenance cost of blow-molded IBCs. The 1/2″ wall thickness provides unmatched durability and long-term performance. is 2-3 units high (depending on container size, weight and temperature exposure).